Temperatures will reach the upper 50s in the Northeast later this week. The storm system that brought heavy snow Saturday from the Northern Plains to the central Appalachians is rapidly moving east Sunday morning, heading out into the Atlantic Ocean. Only a few remnant showers and snow showers are expected in the Carolinas and Georgia through the early morning hours. The storm brought heavy snow totals across Iowa and western Illinois, including 17.5 inches in Mason City, Iowa, and 10.5 inches in Cedar Falls, Iowa. Indianapolis received 10.2 inches of snow -- the second-highest one-day snow total for the city in March. A new storm will develop today in the south-central U.S. The main concern with this new system will be the return of severe weather, and the potential for flash flooding by midweek. (ABC News) Hail, damaging winds and even tornadoes are possible from Texas into Oklahoma on Sunday night and Monday. Scattered thunderstorms are expected to develop along a frontal boundary late Sunday in parts of central Texas and southern Oklahoma. 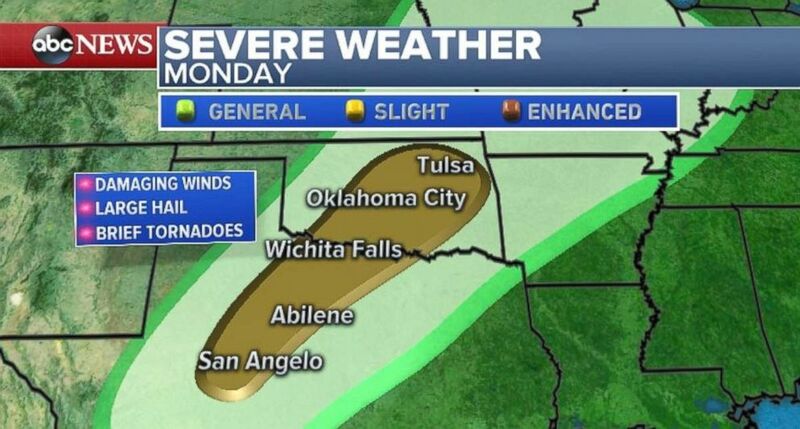 On Monday, thunderstorms are more likely to develop and are expected to be more widespread -- from San Angelo, Texas, to Tulsa, Oklahoma. Damaging winds and large hail are the main threats. While the tornado threat appears to be low at this time, a brief tornado cannot be ruled out. The severe threat will move a little further east on Tuesday and will likely impact major Texas cities, such as San Antonio, Austin and Dallas. 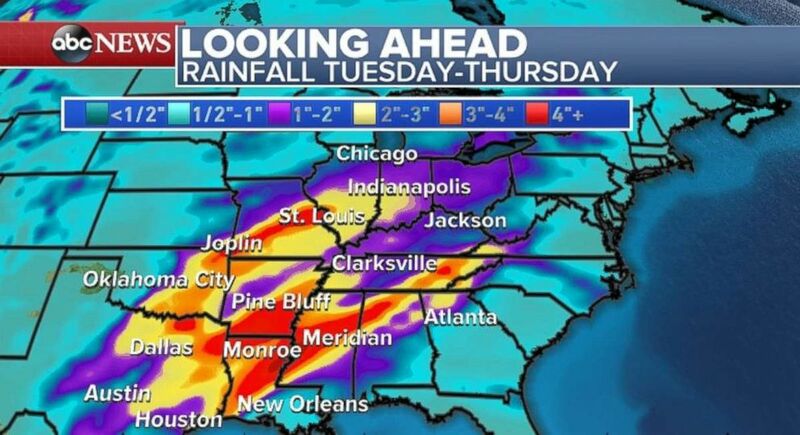 (ABC News) Heavy rain could cause flooding midweek in the Mississippi River Valley. The storm system is not expected to move very quickly to the east due to high pressure building across the East Coast. As a result, numerous, slow-moving thunderstorms will develop over the Southern Plains and Mississippi River Valley by midweek. There is a risk for notable rainfall totals across the region, with many areas likely to receive at least 3 to 4 inches of rain -- especially in parts of Arkansas, Louisiana and Mississippi. Given that a large portion of the region has already received one to two times their average year-to-day rainfall flooding could become a concern later this week. (ABC News) Snow is possible in the Twin Cities and Wyoming on Monday. The new storm system will also bring a quick hit of snow to parts of the Rockies and into the Northern Plains. 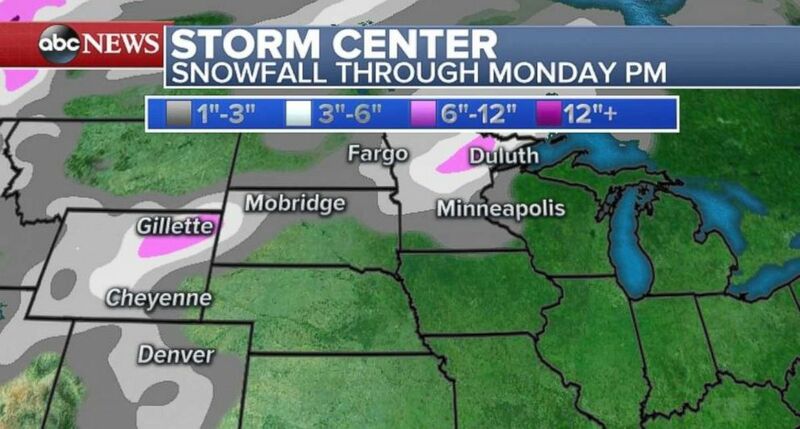 Locally, 3 to 6 inches of new snow is expected in parts of Wyoming and northern Minnesota by Monday evening. The heaviest accumulations should remain rather isolated. Southerly winds, a result of the combination of the storm system and the developing high pressure, are expected to move toward the eastern U.S. by the middle of the week. These winds will bring some of the warmest air the region has seen in weeks. After several nor'easters and average temperatures stuck around 1 to 2 degrees below average, the major I-95 cities in the Northeast will near 60 degrees later this week. That would be a couple degrees above the average for this time of the year and seasonably comfortable. 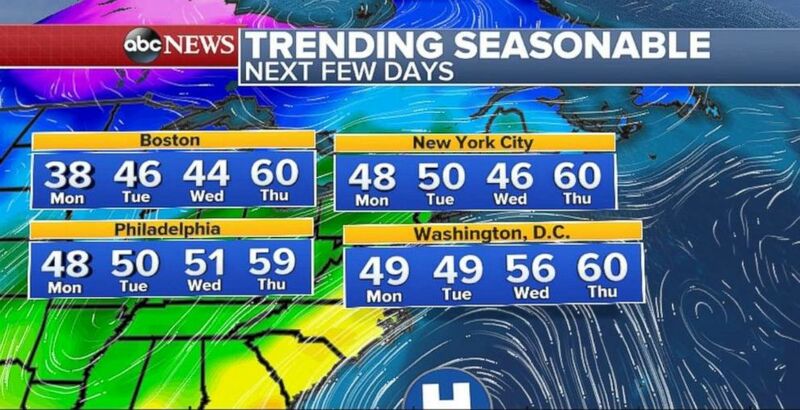 (ABC News) Temperatures will creep up to 60 degrees across much of the East Coast later this week.